Amy over at Keeping up with the Schultz Family tagged me with this fun little game. And it just happens to go right along with Wordful Wednesday. I love to talk, especially when it comes to my kids. But unfortunately I am fighting some nasty bug and can't talk much above a whisper. But that can't stop me from typing about my kids, right?! I took this photo of GG a few weeks ago. 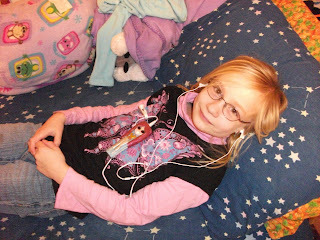 The little doll thing laying on her is her mp3 player. It's a Barbie girl. Not only can you load music on this, and surprisingly a good bit of music, too! But Barbie comes with accessories - shirts, plants, skirts, shoes... the works! GG loves to sing. Usually she makes up her own songs and some days she thinks she'll grow up to be a rock star. For an 8 year old, her voice really isn't all that bad. But she has those er buds in, it's a whole different ballgame! I love my daughter and of course I would never say this to her face, but she cannot hold a tune to save her life when she has ear buds in! And I'm sure we all have met that person who doesn't realize just how loud they are when singing along to their music. They have to sing louder in order to sing over their music. But then a good song comes on so the volume goes up, thus causing their voice to go up in volume as well. Hmmm... I wonder if this is why she doesn't listen. It's not the typical selective hearing that a child has. She's going deaf. Ya, that has to be it! That is terribly cute, though! Look at all her cuteness!!! I love it! She's adorable! That is really cool. I had no idea they made things like this. Thanks for shring. Great picture!